Also confer to the various general TC books. Codex Vaticanus is considered unanimously the most important single manuscript of the Bible we currently possess. With only a few competitors (which are only fragmentary) Codex Vaticanus has the best text of all known manuscripts. It deserves our utmost interest. The codex is generally dated to the first half of the 4th CE. Unknown. Most assume Egypt/Alexandria, T.C. Skeat thinks of Caesarea. The pages measure about 27 x 27 cm. Originally they must have been somewhat larger, because the original folio numbers on the top left of the verso are almost all cut off. Only very few of those numbers remain. The book-cover is not extant anymore, but there are descriptions in old Vatican inventories, that is was made of thin boards covered with red leather. This refers probably to the 15th CE binding. Today the folios are stored individually between paper sheets. No cover is extant anymore. Gregory notes (my translation): "It appears that at some point, probably in the binding process, the folios have been quite heavily pressed. To avoid having the old Greek letters print off on the opposite side, paper has been put in-between the pages. The grain of these papers has been pressed into the vellum and can still be seen. The bookbinder actually did not use clean, new paper but printed ones. I remember that I saw at least once printed letters which have been transfered from the paper to the vellum. (Gregory I, p. 34-5)"
From the fact that printed newspaper was utilized one could conclude that the MS was rebound once more later (Skeat: 18th CE?). The text is written in scriptio continua with three columns per page. This is an unusual number. 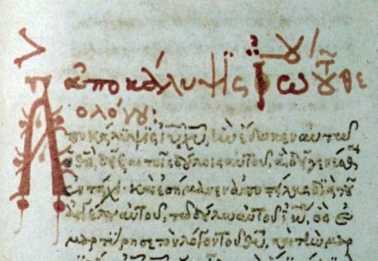 The ink of the text has been retraced carefully and accents have been added, probably in the 10th or 11th CE (Skeat 1999: "before the ninth"). Original (brown) ink can still be seen at many instances (dittographies, moveable-Nu etc.). The codex is defective at the beginning and the end. At the beginning 45 chapters of Genesis are missing, in the middle 10 folios of the Psalms are missing and at the end the second part of Hebrews, the Pastorals and Revelation are missing. These missing parts have been replaced in the 15th CE. The NT part (Heb + Rev.) got the Aland no. 1957. The Pastorals have not been replaced. Nobody knows of course what came originally after Hebrews. Still extant are 591 (AT) + 142 (NT) = 733 old parchment folios. 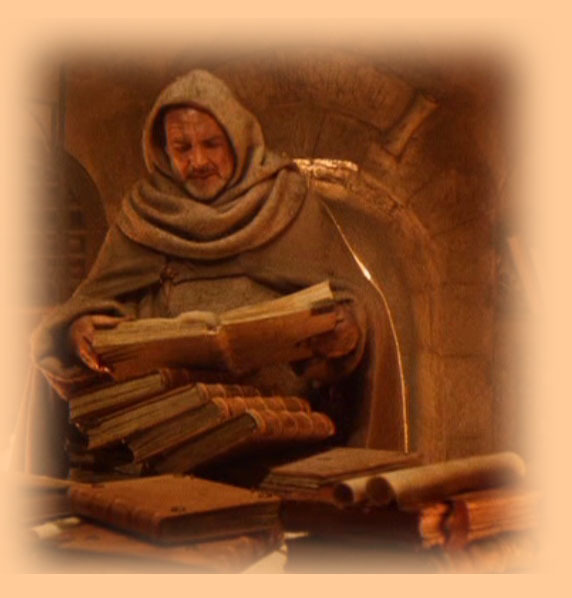 The lost pages were replaced by parchment folios written in minuscule script. All pages have been numbered throughout with Arabic numbers later (1 - 1536). The AT runs from folio 1 to 632 = 1264 pages. 31 folios = 62 pages are missing at the beginning (Gen. 1 - 46:28). These have been replaced by 20 folios (= 40 pages) in minuscule script. Also 10 folios are missing from the Psalms (Ps 105:27 - 137:6). These have been replaced by 6 folios (= 12 pages) in minuscule script. 2. Sa 2:5-7 and 2:10-13 are lost by destruction (cut off). The Macc. books were never included in the codex. The NT begins with folio 633 (Chi-Lambda-Gamma) = originally page 1265. This is today page 1235. It consists of the Gospels (Mt, Mk, Lk, Jo), Acts, the Catholic letters (Jak, 1.-2. Peter, 1.-3. John, Jude) and the Pauline letters (Ro, 1.-2. Co, Gal, Eph, Phil, Col, 1.-2. Thess, Hebrews). The uncial breaks off at Heb 9:14 KAQA[RIEI and the rest of Hebrews and the Apocalypse have been replaced by 18 pages in minuscule script. The present uncial part of the NT is written on 284 pages. If we take the Nestle-26 text as database and calculate the needed pages, we get 6 pages for the remaining Hebrews and 23 pages for the Revelation. The Pastorals would take 11 pages. Kenyon also assumes 40 pages to be missing. We cannot be sure though if those books were really included originally in the codex. So in total the codex originally contained 632 (AT) + probably 162 (NT) = 794 folios = 1588 pages. There worked probably two scribes on the OT (A and B) and one of them (B) wrote the NT. The writing style is very similar to that of Sinaiticus. Although there is not enough evidence to accept identity of scribes, "the identity of the scribal tradition stands beyond dispute" (Skeat). Especially the colophon designs at the end of the books are remarkably similar, sometimes almost identical (see a comparison of the Sinaiticus colophon Mark and the Vaticanus colophon Deuteronomy, here). It is reasonable to assume that both codices have been written in the same scriptorium or at least the same place at arround the same time. There are at least two different correctors from the uncial period. Some corrections are not enhanced by the reinforcer and are therefore very early. It seems reasonable to assign these to either the original scribe or a contemporary, who went through the whole codex and corrected several errors. The second corrector is later and eventually identical with the reinforcer (9th or 10th CE). There are several corrections which leave some text unenhanced and substitute a word or letters. Tischendorf and the ECM date one corrector to the 6th/7th CE. There are also a few corrections from the minuscule era. The original text division is a rather archaic one: For a new section the text is beginning afresh on a new line slightly in the left margin (one letter out), and the rest of the last line is left blank. Smaller sections are indicated by a space within the text and a bar beneath the first letter of that line. It appears that the scribe wanted to introduce the divisions with the indented line (and did so in Mt) but then fell back into the more monotoneous style without indented lines. Eventually he copied these from his exemplar? 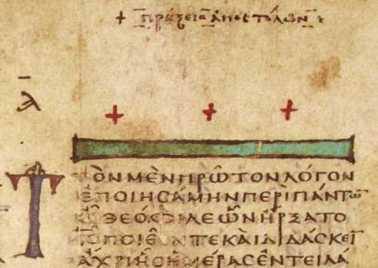 The complete NT is divided into sections by small Greek numbers written in the left margin of the columns. This division is known also in Codex Xi/040 (Lk) and from MS 579. The original colour of those numbers was different from that of the text, presumably a different ink has been utilized. The colour is more reddish. Often the reinforcer enhanced numbers (with black ink), but also often they are left unenhanced (e.g. large portions of Lk and Jo). The numbers appear less faded than the text. If this is because the ink was different or because they were added later is difficult to decide. b) some section numbers are written over the ">" signs for OT quotations or very near to the text. This shows little respect for the first hand text and they are therefore probably not from the original scribe. "A ... system, not original to the MS but added already perhaps in the fourth or fifth century, consists of numbers in the left-hand margin, dividing the text into rather short sections..."
Nevertheless these small section numbers are old. They are written in good uncial script. A dating from 4th to about 6th CE seems reasonable. There are similar section numbers in the OT also. E.g. do we find 150 sections in Deuteronomium. These numbers are eventually written by a different hand than those in the NT and are smaller in size. Regarding them Pierre-Maurice Bogaert writes in the accompanying volume: "l'autre est nettement plus ancien, mais il n'est pas assure du tout qu'il soit original." The Gospels are divided into 464 section: Mt 170, Mk 62, Lk 152, Jo 80. In Mt the section numbers IG, ID and IE are missing. After IB comes IS. Acts is divided into 36 sections. Eventually 2nd Peter was not included in the MS from which these section numbers were copied. The Pauline epistles are divided into 93 sections continuously. Hebrews shows numbers that indicate a position after Gal (in the exemplar from which these numbers have been copied)! The Gospels have no other system than the above small uncials. From Acts on there is another system of divisions. Compared to the above these Greek numbers are rather large and not pure uncial (Skeat: semi-cursive). Stephen Pisano dates them between the 7th and the 9th CE. Skeat (1999) thinks that they have been added in the 15th CE, but this is not convincing, because they are also reinforced. There can be no doubt that these large section numbers are later than the small numbers. In many cases the place of the large number coincide with that of a small number and the large ones are written over the small ones. The reinforcer was obviously anxious to preserve both systems and he rewrote the small numbers next to the large ones in a good uncial style which resembles the original small numbers. Since there was a need to reinforce these large section numbers they can not be placed too near in time to the time of the reinforcement. Some time for fading must be allowed. I would say 7th or 8th CE seems reasonable. These large sections numbers appear in the OT also and are obviously all written by the same hand. The small number " D " and the large section number " H " coincide with the arabic chapter number "3" in Acts. (Also an umlaut can be seen). Acts is divided into 69 sections. SH = Sigma-Eta, means SHMEIWSAI = "of significance"
WR = Omega-Rho, means hWRAION = "beautiful"
a dot with a large semi-circle above it (1401A, 1403A, 1404C ff.). These signs belong together and appear to be quite old. They are very faded and there are some cases where a large section number is written over such a symbol (see below). They are therefore probably older than the large section numbers (dated to the 7th or 8th CE). I can only offer 5th to 7th CE for these signs. If they are earlier or later than the small section numbers, I could not tell. These signs appear also in different hands/times all over the OT. In Acts are several labels for lectionary readings. The sections are labeled with the usual ARch - TEloV symbols and are probably from approximately the 8th CE. It is my impression that the lectionary labels are slightly later than the large section numbers. The first labels are on the left side of the columns, but then two are on the right side, probably because on the left side are section numbers. Note also that not all labels are by the same hand! These lessons correlate fairly well with the common Synaxarion. One passage is strange though. This is Act 7:30-35. Interestingly only at this instance the words T. A EBDOMA appear. Page 1391 C: I have reinforced the letters in the image to make them more clearly visible. "The beginning of the lection for the 3rd day of the first week." 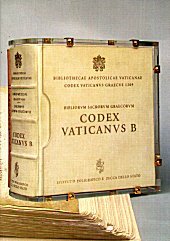 The codex is noted in the first inventory of the Vatican library in 1475 (as " Biblia ex membranis in rubeo"). In 1481 we find in another catalogue: "Biblia in tribus columnis ex membranis in rubeo". Nothing is known about the earlier history for sure. Skeat in his 1999 article speculates that Vaticanus was one of those 50 Bibles requested by Constantine from Eusebius in 330 CE. The arguments he puts forth are very vague and not convincing though. Nevertheless it is all of course possible. First half of the 4th CE: the codex is written. 5th to 7th CE: Symbols in Acts/Catholics added. 10th or 11th CE: Complete text reinforced, Skeat: "before the ninth". It is quite a mystery why the text has been so carefully enhanced in this period. 10th to 15th CE: Addition of coloured book headings. 15th CE: The restoration took place. The missing pages at the beginning, the end and within the Psalms have been replaced by a minuscule hand. Also the codex was probably newly bound. 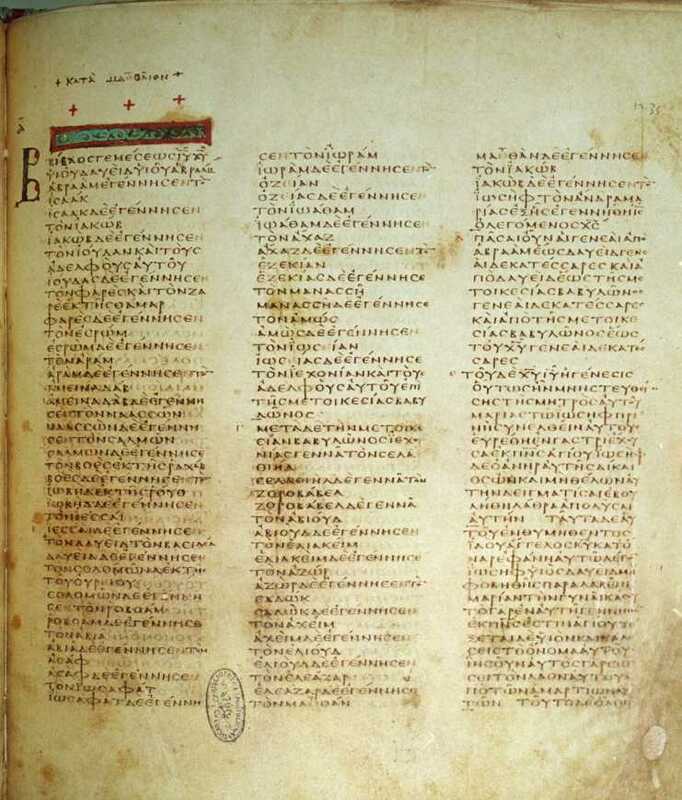 The Genesis supplementum has been copied from Codex Chisianus R VI 38 (OT MS 19). Unfortunately nothing is known about the early history of this MS. The minuscule NT portions could not be identified in any MS. Also, according to Paul Canart (unpublished researches) the writer of the minuscule script cannot be identified with any known 15th CE Greek scribe. It has been proven that the Wisdom text of Codex Venetus Marcianus Gr. 6 (OT MS no. 122) has been copied from Vaticanus. Venetus Gr. 6 was owned by Cardinal Bessarion (ca. 1440 - 1473) and was probably written for him. Bessarion, contemporary of the Council, was a book collector and formed a great collection of Greek manuscripts. It is not clear though if Bessarion ever owned Vaticanus. Skeat (1984) puts forth the hypothesis that the MS was re-discovered in Greece (Constantinople?) in the early 15th century and that it had been restored to present it to the Pope at the Reunion Council 1438/39. Skeat writes (1984): "It is well known that in preparation for the Council, libraries in Constantinople and elsewhere were ransacked for MSS which would support the Orthodox position in controversies with the Latins." Skeat 1999 mentions a letter from Ambrogio Traversari written 7th April 1438 which describes many MSS brought to Italy by the Greeks. This is possible, but Skeats arguments are very weak. E.g. he assumes that the coloured book headings have been created at this point. But why then are the headings of the minuscle part completely different compared to the headings in the majuscule part? Also he assumes that the large section numbers have been written then. But these are much older, they have been reinforced in the 10th CE. Is it possible that the reinforcement happened in the 15th CE? As a matter of principle, yes. But the scribe must have had extraordinary skills then. He writes very good uncial letters and the corrections by his hand are also good. This reinforcement must have been incredibly time consuming. I think that it is possible the the codex has been washed off to create a palimpsest. That a codex ink is fading throughout so strongly is quite exceptional. I think it is possible that at some point someone decided to wash off the ink to create 'recycled' blank parchment. For some reason it was decided later to keep the text and codex and someone had to retrace everything. The Codex is still in the Vatican library and deteriorates. Nobody seems interested in analyzing it.